Doncaster sit joint top of WSL 2 after three wins from their opening three matches. Doncaster Rovers Belles manager Glen Harris says Saturday's Women's Super League 2 match at Everton will be a "big test" for his side. Everton were relegated to the second tier last season while Doncaster were forced to drop down to WSL 2 in 2014 after the Super League's expansion. Harris admitted their experience in WSL 1 makes both sides favourites to go up. "We can't get away from the fact we're one of the fancied teams, that comes from being Donny Belles," he said. 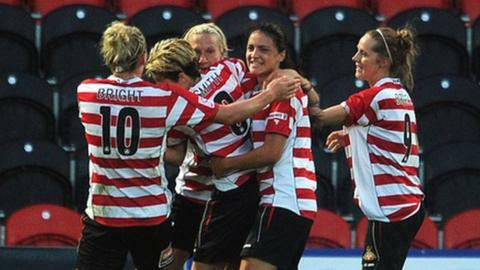 Doncaster sit joint top of WSL 2 with Reading, with three wins from the opening three matches. Everton are yet to lose a match, with five points from a possible nine. "Everton is the next big test on the agenda for us," said Harris. "They're a never-say-die team. So we know for 90 minutes it's going to be relentless. "They're as keen as we are to bounce back into WSL 1. Unfortunately we weren't successful last year, but that's our motivation this year." Harris said victories against other pre-season favourites will give his side confidence as they prepare for Everton. "I looked at teams and identified what I thought were going to be the top four or five," he explained. "Everton were definitely amongst that with Reading, Yeovil and Aston Villa. We've already played Villa and Yeovil and had positive results." Everton's last match saw them beat Charlton in the FA Women's Cup quarter-finals to reach the last four of the competition. However, manager Andy Spence insisted his side will be fully focused on the Doncaster match. "Of course the players will no doubt be looking forward to the semi-final, but we all realise we have big league matches before that, so very much our attentions turn to league matters," he said. "Doncaster have made a good start to the season and they'll be coming into the game confident and wanting to continue their good form but we know we've got the players to match them."